Already, there are plenty of food industry startups with unique business models. But if you are creative & understand the craving of food junkies (and of normal people) in an even better way, there is definitely scope for something new. 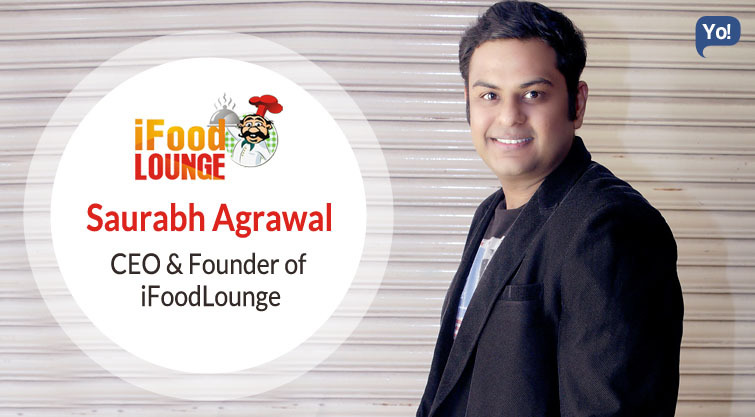 Saurabh Agarwal’s iFoodLounge is a perfect specimen of what we have just stated. Bridging the gap between North India, South Indian, and other popular regional cuisine, iFoodLounge brings together all types of food on one menu & makes it accessible to all through its online platform. Currently bringing together food from 6 states of India at the table, Saurabh Agarwal has firm plans to expand iFoodLounge pan India in next 3 years. Continue reading for his interview to YoSuccess. An online platform that offers local cuisines from across 6 states of India along with global cuisines on one single platform. Some of our key distinguishing menu has been UPWAS SPECIAL that is a special menu carved out for people who are fasting and with such menu on the table can still feast around. Lack of availability of Indian traditional cuisines from various states on a single platform. When we walk out of our homes for a weekend lunch or dinner, the options on the table are north Indian or south Indian food. We wanted to break the jinx of north and south and wanted to on board rich cuisines from across different states of India which are too good to be neglected. The key for us is to have so much of variety on a single platform which is encouraging for a mass living in cosmopolitan cities. Furthermore, with every city turning out to be a cosmopolitan city, the focus on healthy food is going away. Many a times people feel that healthy food means blank food, and that is what we wanted to change. Hence, we have involved a mother who is passionate about cooking to moderate all our recipes so that we can offer healthy food to the mass on an online platform. Stay focused and you will get there! Convincing people to give up on unhealthy junk food and take up healthy food has been one of the key challenges for us. Additionally, it takes a mammoth effort to draw people to online platform for food ordering for a tier-2 city like Indore where people are too conservative on spending on quality food which may be slightly expensive than what they get on the streets. A comparative analysis always comes when it comes to pricing on local streets which although not fair comparison but a welcome challenge for a start-up like us. In short customer acquisition has been the hardest nut to crack. We have not gone big bang like many other players with our menu options. In order to hold the control, we have gone one step at a time and launched menus according to people’s needs. As we were constantly reaching out to mass to know what they want, we have been fairly successful to break down the ice by providing what the customer demanded. I would say the battle is still half won and we have a long way to go to change the mindset of the people. Reaching out to VC or angel investors has not been a focus for us. We want to build a platform first where we are confident of our outcomes and then reach out to VCs for expansion. So far it has been everything from our pocket. One: Perseverance – In a competitive world we are in, it is important to hold on to the ground before calling it the game. Hence, one of the quintessential qualities to achieve success is perseverance. Two: Focus – With low cost players competing in the market to disrupt the quality, at times many people tend to lose the focus. I believe staying focused is a MUST HAVE for a successful stint. Three: Motivation – Many a times, with things not going your way, we feel disheartened. However, one who has learnt the art of self-motivation will never fail in long run. Polar Beat – To keep ourselves fit. Success follows if one is fit. Taking individual interests in consideration with company’s vision and goals make it a productive affair. Hence, we try to preserve individual interests when fighting the battle in the competitive market. At times I tend to get over ambitious and try to make quick moves to make things happen. At some point, a realization triggers that adequate pace is required to start a marathon. Try to solve the real problem than to focus on making money. One must be a good marketer and should know how to sell himself. One – Generate the belief in people that our products/services are serving the purpose. In short, customer acquisition to an extent to keep running. Two – Add creative menus for people who are health and fitness freak, bring some more regional cuisines of UP, Bengal to our marketplace, some global cuisines like Italian on board. Leh – Laddakh – A perfect getaway where the signals of your phone don’t work and you get to see a real you without technology for some time. UK- A place where I have spent considerable time exploring plethora of natural beauty. Perfect to get the ideas pouring. Bahamas – Bliss of a place!